With my Churchwarden’s hat on, I have to remind the flower ladies that Lent means ‘no flowers in church’. It is a time of waiting, of preparation. And although the flower-lover in me misses the pedestal by the altar, it seems right that the church should be empty, bare, austere and cold. The coldest church in Rutland, according to our Priest-in-Charge! One winter, with the best of intentions and thinking particularly of our elderly parishioners, our PCC (with the Bishop’s permission) moved the January and February services to the village hall. Once a Baptist chapel, it still has stained glass, a vaulted ceiling and a baptismal bath under the floorboards. While once a week it turns into a Pilates studio, there’s still plenty of atmosphere. But though we tempted people with coffee and croissants, the experiment did not work: the older members of the congregation did not like it and after the first service, stayed away. They made it clear that, no matter how cold our church is, how uncomfortable the pews, and how basic the facilities, they would rather worship in church – and freeze – than take their coat off in the ‘wrong’ place. So it’s all very well for evangelicals to say it doesn’t matter where we worship, or that our funds should be focused on mission not church maintenance. 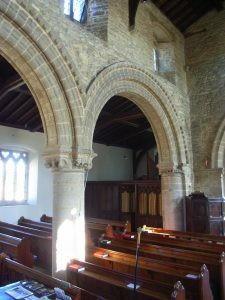 The connection between villagers and their parish church is deep-rooted, and that’s why churchwardens and PCCs devote so much time and effort to keeping the church ‘fit for purpose’. That little rant has little to do with Lent, but much to do with being a Churchwarden! 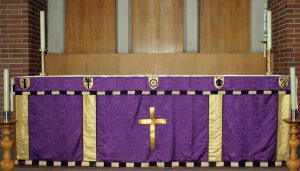 Tomorrow is the First Sunday in Lent, and today Churchwardens around the country will be consulting their official Yearbook (again) and getting ready to change the green altar frontal to the right colour for Lent which is purple. I notice the Yearbook instructs ‘Purple or LA’. I had to google LA and discovered it stands for Lenten Array, which apparently is plain and simple unbleached cloth, usually linen. To be honest, that sounds more appropriate and I wonder how that came to go out of style? Our rich and regal purple seems somehow too jolly for the Lenten period of austerity and denial. See you in church? When it’s my turn on the rota to unlock or lock the church, I try to take five minutes to simply sit in a pew and think. Or is it prayer? I’m not very good at defining it. But I do know that I love the complete quiet of an empty church where the stones have soaked up the tears and laughter, hymns and prayers for 900 years. Every 15 minutes the clock in the tower above me seems to draw a breath before it chimes the quarter, and there’s the occasional squawk of a jackdaw from the steeple. But on the whole this wonderful building is utterly silent when I’m there on my own. So here we are on 8 March, and Easter feels like a long way away. Instead of giving something up for Lent, I’ve decided to take something up. And no, that’s not simply an excuse to eat the occasional chocolate and pour the odd glass of wine. I just feel better about Lent if I do something positive, not negative. The thing I’ve decided to do is between me and God, and I already know I’ll not manage to do it every day, but equally I know God will forgive me. Thankfully. Where would I be without my trusty Churchwarden’s Yearbook? An A5 sized diary that runs from Advent to Advent (the Christian church year, not the secular calendar year), stuffed full of useful information and reminders. What liturgical season are we in? What colour should the altar ‘wear’, what are the lessons for Sunday? It also reminds you of Saints days, and today I am intrigued to see is the day Perpetua and Felicity with some other early Christians were martyred in Carthage in 203AD. You can read a surprisingly detailed account of the awful last days of these two young women, both mothers, who were Christians in the early days of the faith. Sadly we know that Christians around the world are once again suffering religious intolerance. Allegedly nearly 50,000 Christians are detained in North Korea today. Extremists in Pakistan are putting increasing pressure on non-Muslims while several countries in Africa and the Middle East are dangerous places to speak out as a Christian. Would I, could I cope with that? 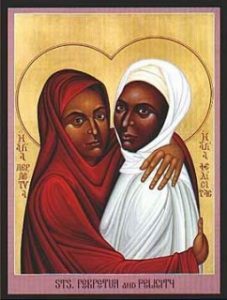 Can I even imagine being a martyr like Perpetua and Felicity? Of course not, but I’m grateful to the Churchwarden’s Yearbook for introducing me to their lives. 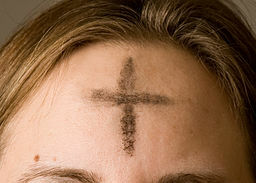 Ash Wednesday, and things start to get serious. After the fun and feasting of pancakes we are brought down to earth with a bump. And ashes. My family was pretty ‘low’ church and as a child what I remember most about Lent was the depressing idea of giving things up: going without… denying yourself. That basically meant no chocolate. No wonder children don’t like Lent! I remember being struck by the coverage given in 2017 to the MP who appeared before a Parliamentary Committee with the ash cross still visible on her forehead, presumably having come from a morning service. At the time, a BBC political journalist thought it so odd they actually questioned whether it was ‘appropriate’ for the MP to be seen to be sporting such a symbol as she went about her working day. Our service is at Duddington church, at 7.30pm this evening, so after church no-one will see the ashes smeared on my forehead, and I’ll no doubt wash it off before I go to bed. I wonder if I would have the guts to go out and about ‘wearing’ the ash cross, if the service had been this morning? Welcome to Lent in the Welland Fosse Benefice. This is the first of the Lent Blog Posts, from Jane Williams. Thankfully, I’ve got the easy part with a general heading of SETTING A COURSE which I am writing from the perspective of a Churchwarden. 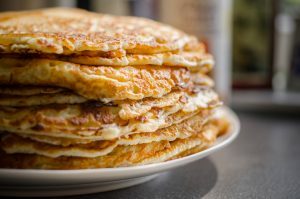 And as today is Shrove Tuesday – Pancake Day – that gives me a good starting point. I once suggested to our then Priest-in-Charge, Geoff Angell, that we liven up the March Family Service by cooking pancakes in church. “It will be a great way to relate Pancake Day to Lent and stuff,” I said. “And it will be fun.” Always game for a laugh, Geoff agreed at once. Fun? What was I thinking of? Morcott church is not exactly equipped for catering: we don’t even have hot water: just a cold tap and sink in the space under the tower. And what were we going to cook on? The answer turned out to be a borrowed paella kit, consisting of a gas bottle/burner and a huge steel paella pan – great for kids to drop their individual pancakes onto, so each could cook their own – and no-one would be tempted to toss them! But it was definitely NOT non-stick and I had no idea how hot it could get. I couldn’t have told you a thing about Geoff’s sermon that day, because I was fiddling with the gas ring and trying not to set fire to any small children, so I couldn’t concentrate. But Geoff and half a dozen brave children (the rest rightly worried about third degree burns) made scotch pancakes from scratch and cooked, or should I say burned, them in front of an on-the-edge-of-their-seats congregation. Afterwards, everyone stayed for melt-in-the-mouth-still-warm-from-the-Aga pancakes safely made by someone else before church. Pancakes may not be very biblical, but I do think those children remembered what they did in church that day, and I certainly did! 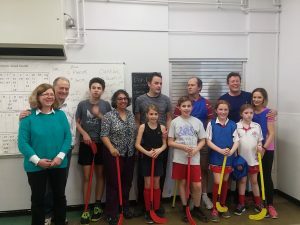 A belated report on the February 2019 Half Term Unihoc challenge! 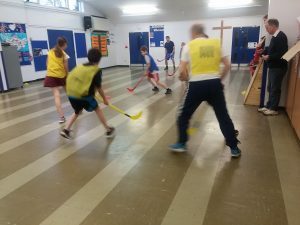 Thanks to the Rev Charlotte Osborn of Oakham Church for suggesting a winter ‘rematch’ following on from last summer’s Rounders tournament. On the day, Morcott and South Luffenham mustered two teams between them, who went up against two Oakham teams at South Luffenham school/community hall. It was fast, furious and fun with each team consisting of Mums, Dads and kids. Officially, at the end of the afternoon, Oakham was judged to have won on the total number of goals scored, but the Welland Fosse Benefice is already planning revenge at this summer’s Rounders meet! Thanks to those who refereed, provided a lovely half-time tea and cleared up afterwards.